Ever since the Jackson Five, Afro is a symbol. Here are 8 products and prints inspired by this cool hairstyle. Above: The Print Ad titled AFRO was done by Saatchi & Saatchi advertising agency for product: Ethnic Multicultural Media Awards (brand: Emma) in United Kingdom. It was released in the Aug 2000. Genius Cookie Packaging Out Of Japan. 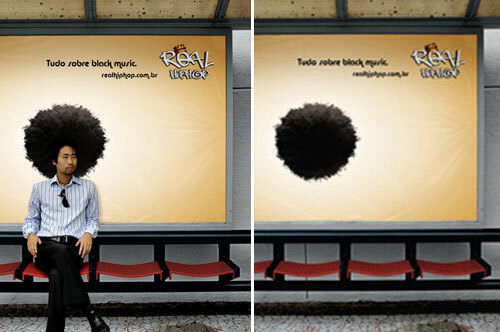 A bus stop ad for Black Music, an urban music label in Brazil, does a brilliant job of using an Afro that blends onto would-be passengers that sit and wait for their bus. Vynal record that uses its backgriund color for an afro portrait. Afro Chair by Yangsoo Pyo use springs to visualize the tangled and puffed up texture of the afro hair. The Print Ad titled AFRO BRUSH was done by Bmp DDB advertising agency for Space Magazine (brand: Guardian) in United Kingdom. It was released in the Dec 2003. Afro Coffee is inspired by the idea that African coffees and teas should no longer be exported solely as raw materials but should instead be offered as independent high quality branded products. The Afro Coffee is more than just a culinary experience. The design, fabrics and colours of the cafe also celebrate contemporary African culture, far from colonial kitsch or tourist folklore.